Taiwan's pilgrimage season, which tends to peak around the third lunar month (Chaucer's April) has long been a time of intense religious devotion, with moving scenes of worshippers (especially elderly women) walking for days from one sacred site to another. There are also mammoth processions, fireworks, dramatic performances, etc. Pilgrimage season is also big business for the island's leading temples, which compete to attract worshippers and enhance their financial and symbolic capital, referred to as "incense power" (香火權威). One of the most famous temple rivalries involves the venerable Chaotian Gong (located in Beigang, Yunlin County; 雲林北港朝天宮) and the Fengtian Gong (in Xingang, Jiayi County; 嘉義新港奉天宮). While these two temples stand a mere three miles apart, tensions over which one could lay claim to being this nation's oldest Mazu 媽祖 temple (開台媽祖) ended up sparking a religious cold war that has lasted 60 years, with neither temple willing to support or take part in the other's activities. Now a historic reconciliation is at hand. On February 4 (the tenth day of the first lunar month, which also happens to be 立春), the Fengtian Gong will reroute its annual procession to stop by the Chaotian Gong, where representatives of the two temples will exchange incense in a rite known as "會香" (a neutral term that avoids any hint of spiritual hierarchy). Taiwan's impressive technological know-how will be devoted to documenting the joyful moment, including minicams on Mazu's palanquin (a palanquin-cam? ), GPS, and live broadcasts on temple websites that can be played on 3G cell phones). One of the most striking aspects of the 甲子-long rivalry between these two sacred sutes is the role played by the another famous Mazu temple, the Zhenlan Gong (located in Dajia, Taizhong County 台中大甲鎮瀾宮). This temple gained increasing prominence during the 1970s, a time of successful economic development (meaning more money for religious activities) that also coincided with the rise of new group of local elites with links to KMT, most notably Yan Qingbiao 顏清標 (shown here with Legislative Yuan Speaker Wang Jinping 王金平 and Taizhong City Mayor Jason C. Hu 胡志強). As the Zhenlan Gong's incense power increased, it chose to challenge its supposedly subordinate relationship with the Chaotian Gong, and when negotiations stalled rerouted its annual procession to stop at the Fengtian Gong instead. It is also interesting to note that these temples have been prominent actors on the political stage. During the 2000 presidential election, supporters of candidate James Soong (Song Chuyu 宋楚瑜), including Yan Qingbiao, held divination rituals at the Zhenlan Gong to demonstrate that the goddess was solidly behind Soong. 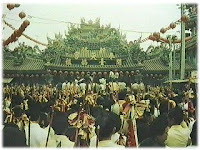 Even though Soong's bid was unsuccessful, these same elites then proceeded to pressure Chen Shui-bian 陳水扁's DPP government to allow a direct pilgrimage to Mazu's ancestral temple in Meizhou 湄州 (located in Putian 莆田, northern Fujian), efforts that have now finally borne fruit. For its part, the Fengtian Gong played a leading role in supporting Taiwan's bid to rejoin the United Nations. Elites from the Chaotian Gong and Fengtian Gong were instrumental in achieving this year's reconciliation, especially their two Chairmen of the Board, Zeng Cai Meizuo 曾蔡美佐 and He Huangda 何煌達. As Cai put it, "There is only one Silent Maiden Lin (=Mazu). Our gods haven't met in decades. It's time for them to drink tea and chat together" (林默娘也有一個，已經幾十年沒有見面，讓祂們喝喝茶、聊聊天). Local worshippers are ecstatic as well, often quoting the expression "Where Mazu goes, peace and harmony follow" (媽祖到，平安到). There are high hopes that the peace-making between the Fengtian Gong and Chaotian Gong will extend to other rivalries. However, it remains to be seen whether the Zhenlan Gong will resume its annual pilgrimage to the Chaotian Gong, or whether the Chaotian Gong will choose to stop by the Fengtian Gong during its own annual procession. Note: For more on the temples described above, please see the work of Chang Hsun 張珣, Huang Mei-ying 黃美英, Lin Mei-rong 林美容, Murray Rubinstein, Stephen Sangren, and Mayfair Mei-hui Yang (楊美惠). The JAS for Free: REVOLUTION!